When we think of Foxconn we think of manufacturing in China. That may about to change with news that the iPhone maker is looking to set up a plant to manufacturer iPhones in India. An advantage of the move might be to lower the price of iPhones in the Indian market and help counter increasing competition from rivals. At this stage there no firm commitment and the reports are based on government sources. An interesting insight has come to light from a failed class action lawsuit by Apple Store staff. It appears at least two employees complained to Tim Cook direct about being subjected to bag checks before leaving their store. Cook sent their complaints to senior retail and HR staff asking “Is this true?” . The lawsuit was seeking to have the employees paid for the 10-15 minutes it could take after work to complete the check. Whilst the Keynote early Tuesday morning was a lengthy affair, Apple was still not able to cover everything. Cult of Mac report that a feature of IOS 9, the new two finger trackpad gesture is actually also coming to the iPhone. I am looking forward to the roll out of this and being able to move the cursor around the screen with much greater ease based on the demo. 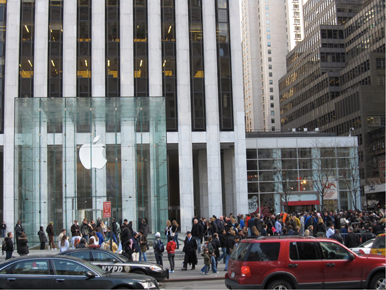 The Apple Fifth Avenue store is one of the iconic Apple stores, and likely on most our bucket lists to get to one day. If you going to the city that never sleeps in the next few months you may have to rethink. In an interview with Associated Press ahead of the opening of a new Apple store in New York, Senior Vice President Retail Angela Ahrendts has revealed that the Fifth Avenue store will soon close for renovations and be temporarily be relocated. No timeline was given on when it will start and finish but you have to assume with it being made public it won’t be all that far away. If you have watched the WWDC Keynote, you will recall the funny opening sequence that gave us a ‘behind the scenes ‘look at the rehearsals for the opening number leading up to the Keynote. Sadly things ran a bit of course in rehersals and we ended up with just Tim Cook walking on stage as normal. In case you missed it Apple has now released the video as standalone and you can watch it below.